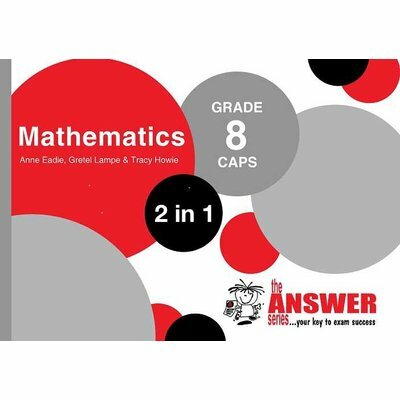 This Grade 8 Mathematics study guide provides a thorough introduction to critical mathematical concepts such as algebra and geometry. This foundation is essential for the development of logical thinking and the growth of knowledge and confidence in this extremely important subject. This 2 in 1 publication includes: Topic-based Questions & Answers – to build an understanding of theory, techniques & concepts in each topic and Exam Papers & Memos – to put theory into practice and reinforce concepts in an integrated way. The first section introduces and builds understanding of each concept through graded questions on each topic. Comprehensive answers to all questions are provided with many extra tips and advice boxes for guidance. The second section consists of a range of exam papers. Detailed solutions with additional explanations, notes and hints are provided to develop the learner’s skills in examination technique. This study guide is beneficial for learners at all levels of competence in this challenging subject.